In 12-inch nonstick skillet, melt butter over medium heat. Add onions, celery and bell pepper; cook 3 minutes, stirring occasionally. In medium bowl, stir vegetable mixture and remaining ingredients except oil and sour cream until well blended. In same skillet, heat 2 teaspoons of the oil over medium heat. Cooking 8 corn cakes at a time, drop corn mixture into oil by tablespoonfuls, spreading each into 1 1/2-inch round. Cook 1 minute to 1 minute 30 seconds on each side, carefully turning once, until golden brown. Cook remaining corn cakes, using 2 teaspoons oil for each batch of 8 corn cakes. Serve with sour cream. These mini corn cakes can be baked rather than fried. Heat oven to 400°F. Spray 2 cookie sheets with cooking spray. 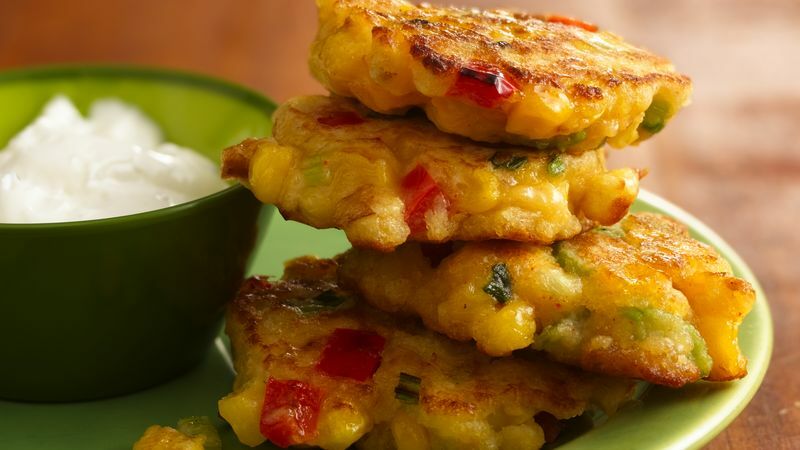 Make corn cakes as directed except omit vegetable oil. Drop corn mixture by tablespoonfuls onto the cookie sheets; press each into 1 1/2-inch round. Bake about 12 minutes, turning once, until golden brown.